I apologize for my lack of posts of late – it was a combination of not doing anything particularly interesting for a short bit and then suddenly doing many things that were extremely interesting and which robbed me of the time and energy to update. My language course ended on March 31st and the next day I took a train up to Kôln (Cologne), where I would meet up with my parents to spend a week and half traveling with them. Our former exchange student, Kiri, lives in Köln, and we were excited to finally meet her and her family in their home city ten years after she had come to live with us for a year in the states. I was particularly excited to see her and her family again since I now have some German language abilities. Kiri’s parents had come to visit us in the states, but they spoke no English and we spoke no German, so when Kiri wasn’t available to translate, the exchanges weren’t particularly fruitful. Not so this time, I hoped. I really enjoyed the train ride up to Köln. Part of it snaked along the Rhine River Valley, offering great views of all the adorable little villages nestled in the hills. Many of them had small castles topping the hills in various states of preservation, from ruins to near perfect. It just felt so German, so far from anything I would ever experience in the U.S. This was also my first solo train trip since arriving in Germany, so I was also excited to test my traveling independence. Evidently, I was successful. I arrived in Köln a couple hours earlier than my parents. I had hoped to use the extra time to wander around the city, but I quickly realized the combination of my heavy bag and inclement weather meant that my time would be much better spent using the free wi-fi at Starbucks. Still, it was pretty impressive walking out of the Hauptbahnhof in Köln and immediately seeing the city’s most striking building – the Kölner Dom, a huge cathedral. I had seen pictures, but none of them could ever do it justice. The church is MASSIVE, and truly beautiful. It’s easily the coolest thing I have seen so far in Germany. Spending time with Kiri and her family was wonderful. My German was not stellar, but certainly functional, and I did a reasonable job serving as a translator between Kiri’s parents and my own when Kiri was not available. It was also very interesting to see where her family lives and works. Her parents own a butcher shop and actually live above the store, so every time we would come and go, we’d have to go through the shop itself, snaking through the line of customers. The building was also one of those classic European homes that are quite narrow and quite tall. The building had more floors than I had ever seen in a home, but there were only one or two rooms on each floor since it was so narrow. Köln itself was unlike any city I had seen so far. It was distinctly modern, but still full of character. There’s plenty of shopping and restaurants to explore, but also some lovely park space, especially along the Rhine. There is also a delicious local beer called Kölsch, which I highly recommend. More importantly, however, I just got the feeling that everyone from Köln is extremely proud of their city and excited to share it with newcomers. 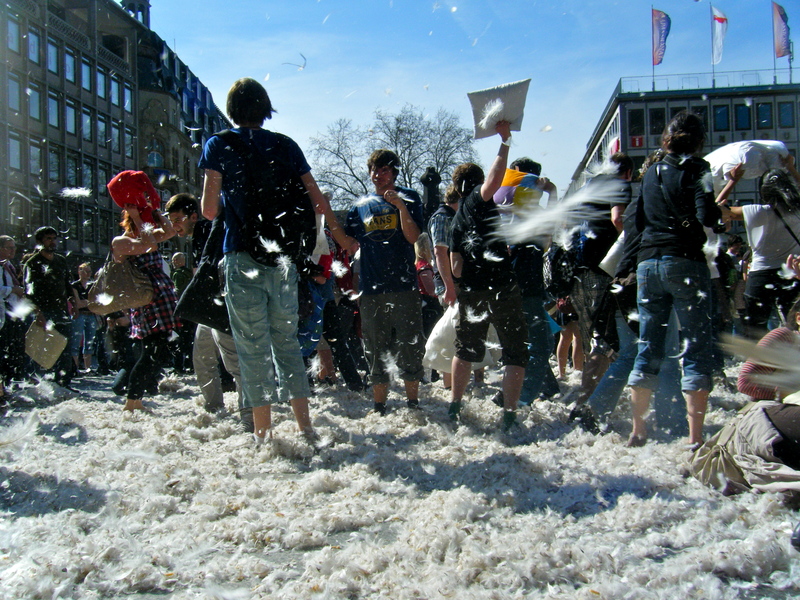 One thing I got to do while in Köln was participate in a pillow fight (Kissenschlacht) in front of the Dom. It was a sort of flash mob organized on Facebook, and it was a ton of fun. It lasted about a half hour and by the end of it, I was covered in feather residue (and kept finding stray feathers the rest of my trip). It was so funny to see all the tourists who had no idea this was going to happen looking on in confusion, wondering how a pillow fight could just spontaneously erupt. 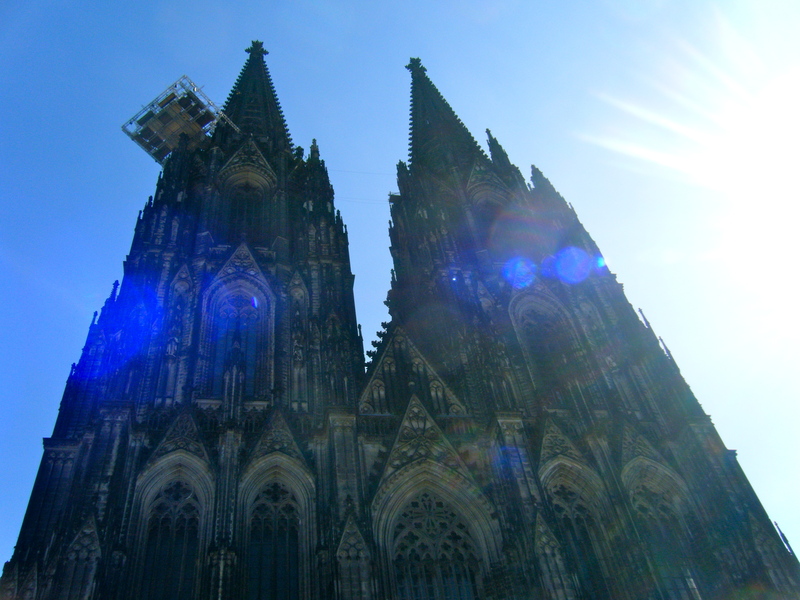 I really hope that I can return to Köln in the summer and see more of the city. It doesn’t have the old world charm of cities like Marburg or Munich, but it more than makes up for that in its overall joie de vivre. The scene in front of the Dom - too fun!